Every year, thousands of visitors from all parts of the world visit the Yarra Valley to relax in a serene setting and enjoy some of the regions famous food and wines. If you are in search of a beautiful winery setting nestled at the foothills of the mountain ranges, then plan a visit to Stones of the Yarra Valley, a premier winery, perfect for a wine tasting or for a special celebration. Stones of the Yarra Valley boasts a rustic atmosphere with a peaceful setting, where visitors can sit back and enjoy the views of the gorgeous mountain ranges and the surrounding lush valley. Stones of the Yarra Valley is known for its excellent wine varieties and delicious gourmet delicacies, so come out here for a day trip and sample the best local produce from this region. A wedding at Stones of the Yarra Valley is a truly unforgettable experience. Everything is taken care of for you with a beautiful chapel on site as well as a manicured lawn, stables and barn all available exclusively for your special day. 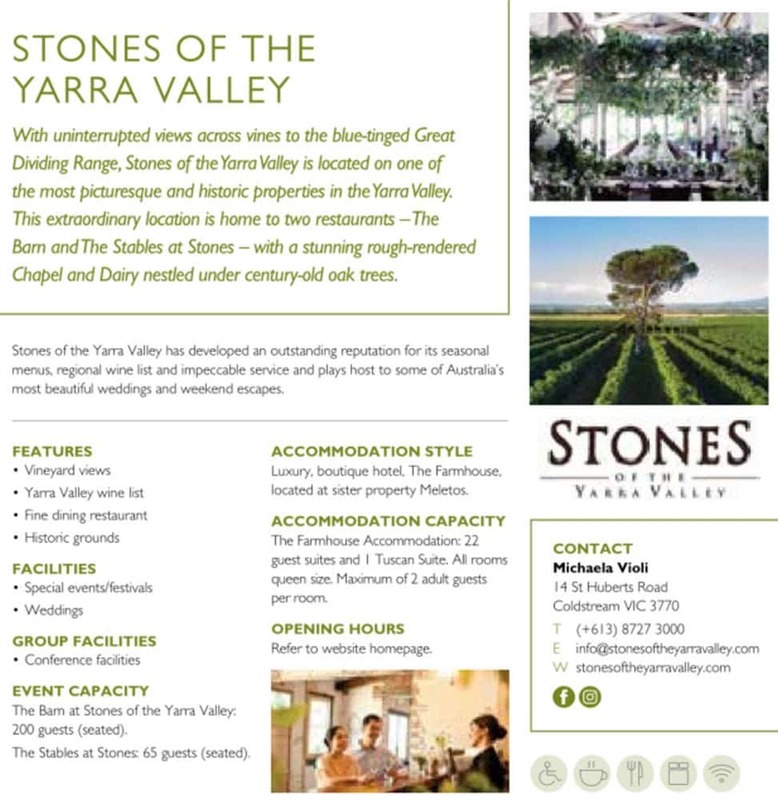 Contact Stones of the Yarra Valley directly for further information on booking your wedding here. You can also find accommodation at Stones of the Yarra Valley with The Farmhouse having of 22 boutique guest rooms and a superb Tuscan suite in one remarkable two-story building. Click on the link below to find a full range of accommodation options near to Stones of the Yarra Valley.